LaserMax today announced the official debut of the H&K VP9 red Guide Rod. This Guide Rod Laser joins LaserMax’s well-established line of red Guide Rod Lasers for popular semi-auto pistols. Incorporating LaserMax’s laser technology, the new Guide Rod Laser offers all the intelligent design features, reliability and ease of use as their other Guide Rod Lasers. LaserMax’s H&K VP9 Guide Rod Laser emits a bright red aiming point that enables fast and accurate target acquisition while dramatically increasing the speed of follow-up shots. “We are very pleased to extend the number of brands we provide guide rod laser solutions for. 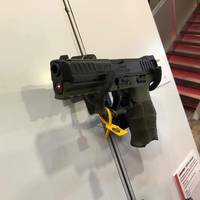 The H&K VP9 guide rod laser extends our dominance and continued leadership in laser deployment technologies”, said Kurt Worden Director of Sales for LaserMax Products. As Rugged as the Gun™, the LaserMax Guide Rod Laser sight system replaces the factory spring guide and recoil spring with a ruggedized laser assembly that incorporates the diode, electronics and battery source. Because it is housed completely within the firearm, installation of the sight does not restrict holster choice or effect grip ergonomics in any way. Unlike lasers that turn on automatically, a modified slide lock lever serves as LaserMax’s signature Controlled Activation™ switch, allowing the shooter to operate from concealment without risking a potentially dangerous reveal of his or her position. Placement of the laser and switch also reinforce the NRA’s rules for safe handling of firearms and prevent any potential blocking of the beam, which projects from immediately under the bore for the highest accuracy. Velocity Outdoor is a leader in the outdoor enthusiast market, featuring a diverse product lineup in the outdoor sporting goods industry with Crosman and Benjamin Airguns, Ravin Crossbows, CenterPoint Archery and Optics, LaserMax laser aiming devices, and GameFace Airsoft. Velocity Outdoor is a subsidiary of Compass Group Diversified Holdings, LLC (NYSE: CODI).